Try something different at EGU 2018– choose a PICO session! 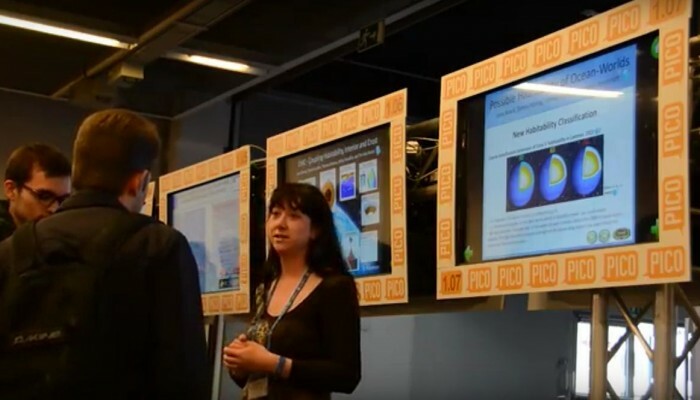 Lena Noack presenting her research with a PICO presentation at the EGU General Assembly. Some of the sessions scheduled for the upcoming EGU General Assembly are PICO only sessions. This means that, rather than being oral or poster format, they involve Presenting Interactive COntent (PICO). The aim of these presentations is to highlight the essence of a particular research area – just enough to get the audience excited about a topic without overloading them with information. What’s great about this format is that it combines the best of oral and poster presentations. It allows researchers to stand up and be recognised for great research while giving an oral contribution as well as discussing their work in detail and networking with other participants. PICO sessions start with a series of 2 minute long presentations – one from each author. They can be a Power Point, a movie, an animation, or simply a PDF showing your research on a display. After the 2 minute talks, the audience can explore each presentation on touch screens, where authors are also available to answer questions and discuss their research in more detail. Presenting a PICO for the first time can be daunting, so we’ve prepared a guide which talks you through the format step-by-step. It’s packed with practical tips on the best layout for your PICO, how to capture the audience’s attention in just two minutes and how to get the most out of the discussion at the interactive screen. being a recent undergraduate or postgraduate student (conferral of degree after 1 January of the year preceding the conference) who are presenting their thesis work. Entering couldn’t be easier! Make sure you nominate yourself when you submit your abstract on-line. You’ll receive a letter, known as ‘Letter of Schedule’, confirming your presentation has been accepted, which will also include a link by which to register for the award. Before the conference, make sure you include the OSPP label (which you can find here) to your PICO presentation header so that the judges of the OSPP award now to evaluate your presentation. EGU 2018 will take place from 08 to 13 April 2017 in Vienna, Austria. For more information on the General Assembly, see the EGU 2018 website and follow us on Twitter (#EGU18 is the official conference hashtag) and Facebook. Some of last year's ECS awardees with the EGU President and Vice-President at the EGU 2017 Awards Ceremony (Credit: EGU/Foto Pfluegl). From 8th to the 14th October a number of countries across the globe celebrate Earth Science Week, so it is a fitting time to celebrate the exceptional work of Earth, planetary and space scientist around the world. Yesterday, the EGU announced the 49 recipients of next year’s Union Medals and Awards, Division Medals, and Division Outstanding Early Career Scientists Awards. The aim of the awards is to recognise the efforts of the awardees in furthering our understanding of the Earth, planetary and space sciences. The prizes will be handed out during the EGU 2018 General Assembly in Vienna on 8-13 April. Head over to the EGU website for the full list of awardees. Nineteen out of the total 49 awards went to early career scientists who are recognised for the excellence of their work at the beginning of their academic career. 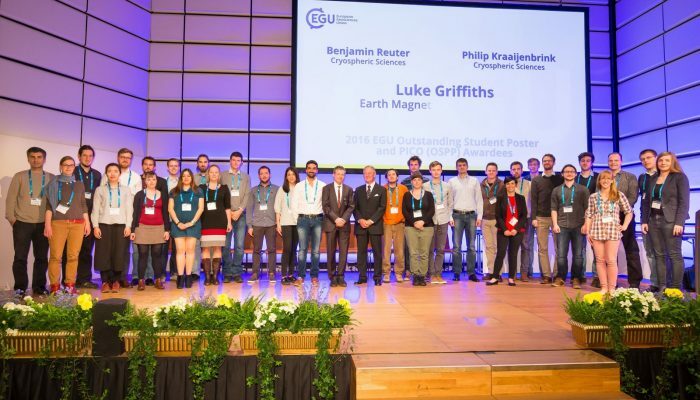 Fifteen of the awards were given at Division level but four early career scientists were recognised at Union level, highlighting the quality of the research being carried out by the early stage researcher community within the EGU. Nine out of the 49 awards conferred this year recognised the work of female scientists. Of those, four were given to researchers in the early stages of their academic career (at the Division level). 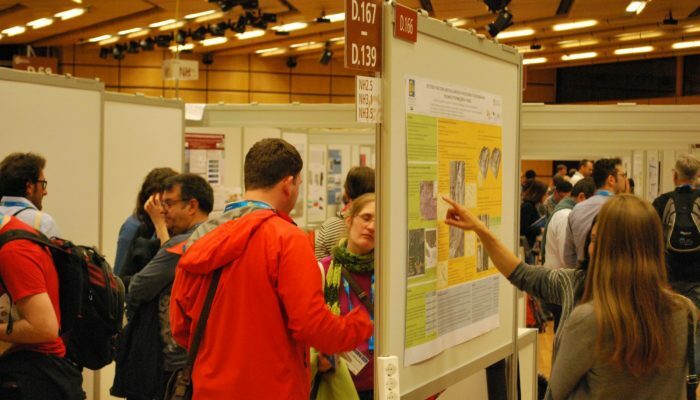 As a student (be it at undergraduate, masters, or PhD level), at the EGU 2017 General Assembly, you might have entered the Outstanding Student Poster and PICO (OSPP) Awards. A total of 57 poster contributions by early career researchers were bestowed with a OSPP award this year recognising the valuable and important work carried out by budding geoscientists. Judges took into account not only the quality of the research presented in the posters, but also how the findings were communicated both on paper and by the presenters. Follow this link for a full list of awardees. Further information regarding how to nominate a candidate for a medal and details on the selection of candidates can be found on the EGU webpages. For details of how to enter the OSPP Award see the procedure for application, all of which takes place during the General Assembly, so it really couldn’t be easier to put yourself forward! The EGU General Assembly is taking place in Vienna, Austria from 8 to 13 April. The call-for-abstracts will open in mid-October. Submit yours via the General Assembly website. Every year at the General Assembly hundreds of students present their research at the conference with a lot of time and effort going into preparing these presentations. 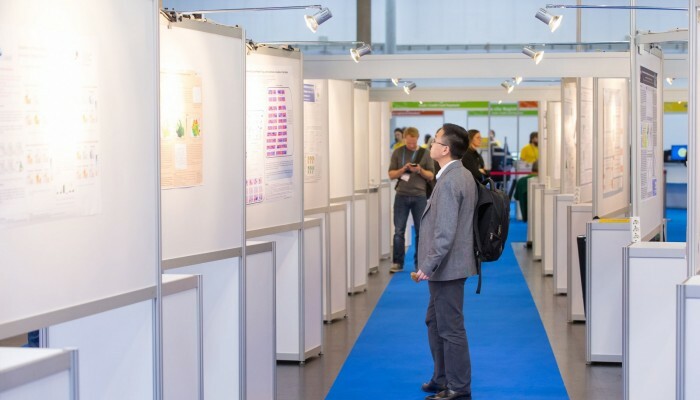 With the aim to further improve the overall quality of poster presentations and more importantly, to encourage early career scientists to present their work in the form of a poster, the OSP Awards (as they were formerly known), were born. Since last year’s General Assembly, PICO presentations are included in the Outstanding Student Poster Awards, which have been renamed to Outstanding Student Poster and PICO (OSPP) Awards. But, how can you make sure your poster or PICO is a great presentation which achieves that? At the 2015 General Assembly we spoke to some of the judges and past winners of the award and asked them to share their thoughts on what makes a top poster presentation. We put their top tips together in this short video, which gives you a good idea of the key elements you ought to be thinking about when preparing your poster or PICO presentation. If you are participating in OSPP, don’t forget to attach the OSPP label (blue SVG, blue PNG, yellow SVG, yellow PNG) to your poster board. Alternatively, you might include the label in the poster itself. If you participate with a PICO, you are kindly asked to add the OSPP label to your PICO presentation header. The OSP awards are presented at the level of the EGU Programme Groups which in 2015 saw an improved way of signing up for the award and also judging of the presentations. A post from the blog archives also has full details of how the presentations are evaluated and you can also find detailed information about the award on the EGU website. The EGU General Assembly is taking place in Vienna, Austria from 23 to 28 April. Check out the full session programme on the General Assembly website. The schedule is out, presentation slots have been assigned and it’s time to start thinking about putting yours together. Whether you have an oral, poster or PICO slot, we have a suite of simple guidelines to get you ready for the conference! The guidelines for oral presentations are online. All oral presentations should have the dimensions 4:3 or 16:9 and last about 12 minutes, with 3 minutes for questions. Oral presentations take place over four 90-minute time blocks. Make sure you’re in the presentation room approximately 30 minutes before your time block starts, so your presentation can be uploaded or so you can connect your laptop to the system. There will be a lecture room assistant to help you get everything ready. Guidelines for poster presentations are also online. Importantly, the poster boards landscape and are 197 cm by 100 cm. Posters should be hung between 08:00 and 09:00 on the day of your scheduled poster presentation using tape available from roaming student assistants. Please retrieve your poster at the end of the day (between 19:00 and 19:30). Those that are not collected will be disposed of. By the start of the Assembly, EGU will have sent your Authors in Attendance Time – during this time, you must be present at your display. If there is a gap in the corresponding oral session, conveners may call upon poster presenters to give a short ad hoc summary of their posters. Therefore, it might be useful to have a couple of slides (1-2) prepared in advance to help illustrate your findings. For the fifth year now we have got a different kind of presentation: Presenting Interactive COntent (PICO). The guidelines for PICO presentations are available online. PICO sessions combine the best of oral and poster presentations. Every PICO author presents their slides in a “2 minutes madness”. After these short presentations, all attendees have enough time to watch the presentation again on interactive screens and hold discussions with the author and other attendees. These presentations are shown on widescreens, but some of the screen space is used for branding of the contribution and navigation, so the ideal dimensions for your presentation are the classic 4:3 format. You can also use the 16:9 format, just alert one of the conference assistants if this is the case, as they’ll help you determine the best position of the navigation buttons, so they don’t detract from your presentation. One thing to keep in mind is that, unlike in the past, PICO presentations no longer support Prezi. For tips on how to make a PICO presentation, why not download the How to make a PICO guide. For a first-hand account of what it’s like to take part in a PICO session, take a look at this post by early career scientists in the Seismology Division too. If you are presenting a poster or PICO at the upcoming General Assembly you can have your presentation considered for an OSPP Award. Stay tuned to GeoLog for an upcoming post where we’ll tell you how to register yourself for the award, as well as a video featuring past OSPP judges explaining what it is they look for in a winning poster. There is free tea and coffee available in the poster halls in the breaks between TB1 & TB2 and TB3 & TB4, and wine available during TB5. If you already know that your abstract will not be presented, you are kindly requested to withdraw your corresponding abstract as soon as possible. Announcing the winners of the EGU Photo Competition 2019!